Echo Canyon is a delightful slot canyon located right in the heart of Zion National Park. To begin the route canyoneers hike up the popular East Rim Trail then traverse over slickrock to drop down into the slot canyon. The canyon is a fun one with lots of entertaining downclimbs and short rappels. The route ends where the East Rim Trail and Echo Canyon meet. Its an odd site for East Rim hikers to see canyoneers emerge from the slot in wetsuits. Equipment: 60' rope, webbing, helmet, harness, rappel device, map, dry bag and wetsuit. Technical: About 6 short rappels, depending on water levels some can be down-climbed. A hand-line can be helpful when down-climbing. Difficulty: The conditions in Echo Canyon, like most slot canyons, change rapidly and constantly. Echo Canyon is a technical slot canyon that often has cold water sections that must be swam. The water is cold enough that canyoneers shiver in a 3mm suit in the summer. There are difficult down climbs and a keeper pot hole might be present depending on the current conditions of the canyon. The trail up to Echo Canyon is an uphill strenuous hike on a paved and populated trail. Obtain current canyon conditions at the Zion backcountry desk before attempting any slot canyon hike. 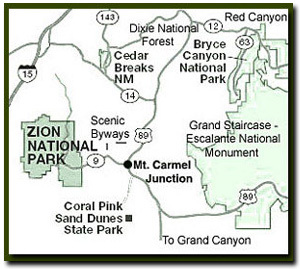 Trail Access: During the summer canyoneering season park at the Zion Canyon Visitors Center, the Zion Human History Museum or Canyon Junction and ride the Zion Canyon Shuttle. Get off at the last to the last shuttle stop. Off the Beaten Path: Observation Point is a heavily used trail, but once dropping into Echo Canyon ZNP only allows 12 canyoneers per day. Best Season: Mid-June to mid-September when the water in Echo Canyon is warmer. Hazards: Spring and winter canyoneering in this canyon has snow hazards. Call the Zion Canyon Visitors Center for weather conditions prior to the hike: (435) 772-3256. Canyoneering in slot canyons presents a very real danger from flash flooding. Do not enter slot canyons if it is raining. Remember a storm far off can trigger a flash flood. Check the weather report. Echo Canyon has a moderate flash flood danger. Never enter a semi-technical or technical canyon without the knowledge and skills needed to safely explore and return. Many technical canyons also require GPS skills or excellent map reading skills. In the winter and spring the water in the slot canyon is ice cold. This hike is best done in the summer when the water is warm. The stream that runs through Echo Canyon may dry up in the summer leaving behind pockets of water that may stagnate. The more water that is present the harder exploration will be. Rappelling skills are required to navigate through this slot canyon. Remember slot canyons can change dramatically in a short time due to flash floods and water levels in this canyon change. These directions are only a general reference. Be prepared for variations in the canyon. This is a magnificent slot canyon right in the heart of Zion Canyon. Technical canyoneers will be thrilled with the narrow slot canyon, pools of cold water to swim, exciting down climbs and odd-start rappels. Tanya Milligan in Echo Canyon, a cold narrow slot canyon located along the Observation Point Trail. Trailhead: Echo Canyon - Begin at the Weeping Rock parking lot located about midway in Zion Canyon. Hike 2 miles up the Observation Point Trail to where the trail crosses a wash. There is often water present especially in the winter and spring. This is where the slot canyon is exited. Bypass this area for a moment and continue up the Observation Point Trail to the East Rim Trail junction. Follow the East Rim Trail for about .5 miles, watching for a wash. Cross the wash and look for an area to drop into Echo Canyon. Try and drop in high up in the canyon. Echo Canyon - The slot canyon is impressive with many high wall sections and erie lighting. There are some areas blocked by boulders that will be difficult to climb up and down. A good climber should be part of the group. Be prepared for pools of neck high cold, stagnant water and pools that must be swam and may contain debris. The rappels and downclimbs should be 20' or less. The conditions in this slot canyon change.